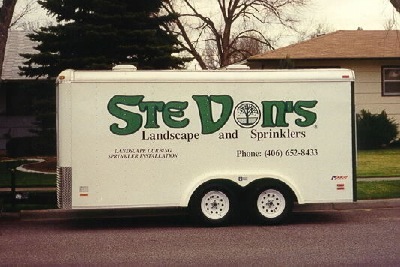 Hello from SteVon's Landscape and Sprinklers! Thank you for visiting our new Internet web site. We want to give you the opportunity to get in touch with our company and our offers. So, please contact us at 406-652-8433. We are looking forward to hearing from you. You can also contact us at our e-mail address: stevons@qwestoffice.net. Our company was established in 1996 and has been responsible for providing outstanding complete landscaping services ever since. Our specialty is in the areas of customized underground sprinkler systems and concrete curbing. We also can provide grading and soil prep, sod, seed and hydroseeding, Kichler landscape lighting, rock work, retaining walls, concrete sidewalks or slabs....It's a one stop shop!